When I saw a commercial on TV advertising Home Auctions in Tampa, I thought I’d check it out. I called the auction company and they explained to me that you can place a bid online, or show up at the auction and see the home the day before. There were only a handful of homes for sale on their website and most of them had already been sold 4 days before the onsite auction was to take place. Short sales, bank owned and foreclosures once flooded the housing market in Florida, but more recently foreclosure filings are the lowest they’ve been in years and auctions seem to be gaining popularity. 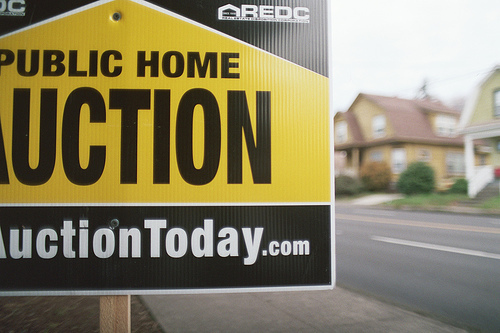 When purchasing a home at auction the first thing to think about is that you will most likely have competition on bids. That, along with the short supply of sellers using this method to sell their home, many home investors and buyers think twice about ruling out other options. Can you finance a property at auction? When placing a bid on an auction home you will need to have cold hard cash! That’s right, no financing contingency. Some auction companies will allow financing, however the contract will not leave you an out should you lose your job, get transferred, or become unqualified for any reason. Your escrow deposit will be non-refundable! What about all those buyer’s fees? They are usually called buyer’s premiums or auction fees and are added on to the price of the winning bid. The fees can be between 1% and 6% of the total purchase price of the home. Ouch! On a bank owned home for sale you will know if there are any other offers, how long it’s been on the market, what the original price was AND get an answer from the bank with in 24-48 hours typically. Homes that are listed as short sales are an entirely different story. The bank has the option look at other bids, and they may take as long as 45 -90 days to respond to your offer. If you’ve got the time, this may be a good way to get a deal in today’s housing market. Then you have the MOTIVATED SELLER! Let’s face it…..who is putting their house up for sale unless they absolutely have to? Depending on when the owner purchased the home and how much equity they have, will depend on the deal you can get. Bank owned and short sale homes are listed in MLS. Period. In the Tampa Bay buyer’s market it’s all about getting the best deal. Know your options, obtain the services of a REALTOR and do your research.